Stay calm and move slowly. Leave a way for the animal to escape. If possible, back away slowly, do not turn your back on the lion or start running. Raise your arms to appear larger. Lift up children to prevent them from running. If you are attacked -- fight back. Try to remain on your feet and use rocks or your hands to fend off the animal. Range: Widely found throughout the western U.S. Size: Adult males may be more than 8-feet long and generally weigh between 130 and 150 pounds. Adult females weigh between 65 and 90 pounds. BIG BEAR LAKE -- One of the founders of Safari Club International has planted a disturbing thought in the minds of outdoor enthusiasts: Their activities could endanger their lives. "I think that, eventually, mountain lions could make lunch out of people," said Bill Sherman, one of the founders of the SCI and current Los Angeles chapter president. "People call to say they are watching mountain lions watching kids go to school. The (mountain lions) are out of control." Sherman, a former Arcadia resident, said that with no natural predator left, mountain lions have become emboldened. He believes that as their population increases, they will attack more people. "Mountain lions have to go somewhere," he said. "I think we could have trouble." Sherman's solution? A limited mountain lion hunting season. But he has a big problem: A 30-year ban on hunting lions, created by a statewide initiative that can only be removed through another initiative. The initiative has created numerous problems, hunters and ranchers said. Hunters claim deer numbers have dramatically decreased as lion populations have increased. The L.A. County Fish and Game Commission funded a program to learn why the Nelson bighorn sheep population in the San Gabriel Mountains is substantially falling; and biologists have determined that the mountain lion population, and the lack of controlled burns in wild, are the two major factors. Ranchers in rural parts of the state said lions have begun preying on their livestock, too, as the lions' natural food supply has decreased. "The mountain lion population is increasing," Department of Fish and Game senior wildlife biologist Doug Updike said. Updike said sightings have increased because people are more aware of lions. He said sightings have increased by more than 13 percent in Los Angeles County. Updike said the DFG received an average call of one sighting per day in 1978. "In 1995, it was our zenith," he said. "But they've toned down to some degree." Also areas that have traditionally been rural have become populated, infringing on mountain lion habitat. But mountain lions making people a regular target? "That is utterly ridiculous," Updike said. "They would be eating a lot more people. There would be a lot more attacks." 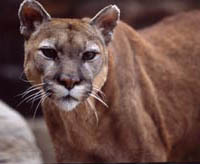 There have been five confirmed deaths and 10 other confirmed attacks by mountain lion reported in the last 120 years. That last death by attack was an Orange County bike rider in January 2004. The last confirmed attack was in June 2004 in Sequoia National Park. The only confirmed non-fatal attack in the San Gabriel Mountains was on Mount Lowe about Pasadena on a cyclist in 1995. Sherman contends that a hunting season for the cats would not harm their numbers, and would help contribute to wildlife's ecosystem. Plus, he said, a hunt of that magnitude would more than likely generate thousands of dollars in permit fees, money which the DFG would use on wildlife habitat research. And baggin a lion? It would not be like going to Africa for a safari. Mountain lions are cagey. They do not want to be spotted. They hide in brush and sneak up on prey, attacking with one quick move not far from cover. A hunter bagging a lion would definitely be far from a sure thing. Of all depredation permits for problem animals issued by the DFG last year, less than half were successful, Updike said. The problem with a hunt, or for that matter, learning about the population, is a lack of research. The DFG does no research on lions. The valuable funds needed for research cannot be used because the DFG is prohibited from managing the cats. Various reports have the California population at between 4,000 and 6,000 cats. No one knows for sure. "How much wildlife can the habitat support?" Sherman asked. "How is this affecting the habitat" We need more solid information. We need to take control of them. They've decimated the deer herd populations and piglets." Keith Lair can be reached at (626) 962-8811, Ext. 2272, or by e-mail at keith.lair@sgvn.com.